Browse: Home / 2017 / March / 31 / Breaking: In New Study Leading Warmist Scientists Determine Sun Plays Major Role – Warming Delayed by Decades! Climate scientists at Switzerland’s renowned ETH Zurich and the University of Bern have long warned of the risks of man-made global warming. But in a brand new study their results now appear to have compelled them to postpone the expected global warming – by a few decades! They now claim that a weaker sun (now expected over the coming decades) could reduce temperatures by half a degree Celsius. Moreover the scientists clearly concede that the earth’s climate system is nowhere near as well understood as some scientists would like to have us believe and that the sun indeed plays a major role after all – enough so to override and postpone the effects of the often hyped greenhouse gases. This will be hugely disappointing news for the catastrophe-hopers and cheerleaders, who hold front row tickets to the announced climate catastrophe, which according to some should be happening already. The Swiss scientists say that sun’s impact on climate change has now been quantified “for first time” (see postscript below). The Swiss scientists say that their model calculations show a plausible way that fluctuations in solar activity could have a tangible impact on the climate. The Swiss National Science Foundation-funded studies now expect human-induced global warming to tail off slightly over the next few decades. A weaker sun could reduce temperatures by half a degree. There is human-induced climate change, and there are natural climate fluctuations, the scientists acknowledge, and say one important factor in the unchanging rise and fall of the Earth’s temperature and its different cycles is the sun. As its activity varies, so does the intensity of the sunlight that reaches the earth’s surface. Previously IPCC reports assumed that recent solar activity was insignificant for climate change, and that the same would apply to activity in the near future. However, researchers from the Physical Meteorological Observatory Davos (PMOD), the Swiss Federal Institute of Aquatic Science and Technology (EAWAG), ETH Zurich and the University of Bern are now qualifying this assumption. Their elaborate model calculations now provide a robust estimate of the contribution that the sun is expected to make to temperature change in the next 100 years and a significant effect is apparent. They expect the Earth’s temperature to fall by half a degree when solar activity reaches its next minimum. Project head Werner Schmutz, who is also Director of PMOD, says this reduction in temperature is significant and believes it could win valuable time if solar activity declines and slows the pace of global warming a little. At the end of March, the researchers working on the project will meet in Davos for a conference to discuss the final results. The project brought together various research institutions’ capabilities in terms of climate effect modelling. PMOD calculated what is known as “radiative forcing” taking account of particle as well as electromagnetic radiation, ETH Zurich worked out its further effects in the Earth’s atmosphere and the University of Bern investigated the interactions between the atmosphere and oceans. The Swiss researchers revamped the commonly used models, which were criticized for overstating CO2’s impact, and assumed a greater fluctuation in the radiation striking the Earth than previous models had done. According to their press release, Schmutz is convinced “this is the only way that we can understand the natural fluctuations in our climate over the last few millennia.” He says that other hypotheses, such as the effect of major volcanic eruptions, are less conclusive. Warnings of a little ice age? But since we have been observing a consistently strong phase since 1950, it is highly likely that we will experience another low point in 50 to 100 years’ time. It could be every bit as intense as the Maunder Minimum, which brought particularly cold weather during the 17th century. The research project also placed great importance on the historical perspective. The Oeschger Centre for Climate Change Research at the University of Bern compared data series on past solar activity with other specific climatic conditions. People have been recording the number of sunspots, which correlates well with solar activity levels, for some three centuries now. However, it is much more difficult to quantify exactly how cold it was on Earth back then. “We know that the winters during the last minimum were very cold, at least in northern Europe,” says Schmutz. The researchers still have a fair amount of work to do before they have a detailed understanding of the relationship between solar activity and the global climate both in the past and in the future. It needs to be noted that other scientists have already quantified the sun’s impact to a lesser or similar extent, but were ignored. The latest Swiss studies merely confirm what dozens of other skeptic scientists have been saying over the past 10 years. Claims of being “the first” are a bit fake. The real threat is and always has been the return of an ice age. There is almost a 100% certainty of an ice age returning, during which humanity will likely suffer greatly. CAGW is purely speculative and contradicts all of human history, given that societies grew and thrived as the earth warmed. And when it come to “scientific” 100-year forecasts or predictions, these are made only by two types of people: prophets and charlatans. And we are 99.99% certain that climate scientists are not prophets. But since we have been observing a consistently strong phase since 1950, it is highly likely that we will experience another low point in 50 to 100 years’ time. Are you or the scientist you are paraphrasing prophets or the other thing? Scientists at Switzerland’s renowned ETH Zurich and the University of Bern are covering their butts by producing an even wider range of prophesies. The AGW scam way of doing things. Suddenly as the sun has a bit of a snooze, it is now “realised” that the sun has a major effect on climate. When a prophet at the top of a mountain has to tell his followers that the end of the world is postponed with a few decades, he provides them with a new prophecy, quite often more compelling than the former (see Festinger). I’ve often wondered if we’ve seen the extremes of what the Sun can do over 100,000 years. Does the final trigger for a real ice age come from the sun? which means sun plays a far greater role in climate, which means the models have all been wrong. What you (and Kenneth) keep overlooking is that just because there are natural, period fluctuations, those do not magically cancel out anthropogenic influence. If it gets colder at night because the sun is not shining that doesn’t mean it cancels global warming. So maybe those scientists are right and it will get colder. It would get even colder without the increased greenhouse effect. And that’s the whole point of the “warmists” – as you so lovely call them. What you keep overlooking is that for each “natural, periodic fluctuation” discovered, it reduces the potential of anthropogenic influence. If the sun will drop us half of a degree centigrade over the next 50-100 years, then so, too, will we need to drop estimates of total influence from anthropogenic forcings by the same amount for the preceeding 50-100 years. That means, if we are entirely conservative in assessing the sun’s effects according to this paper, the anthropogenically-attributed warming of 0.8 – 1.0 C over the last century is actually 0.3-0.5 C of warming not due to the sun. And this is only with solar influence being taken from the equation. We still have wide uncertainties over much of the earths’ climate system and the interdependent variables that govern it. Anthropogenic effects, as a result, are likely far less than worrisome. What you have to understand is that SebastianH doesn’t realize that the greenhouse effect is predicated on solar irradiance. Without solar heating, there is no heat to “trap” for the alleged greenhouse properties of CO2. So if solar activity declines, so does the opportunity for CO2 to retain that heat. Here is an actual quote (copy/paste) from SebastianH about the “magical” qualities of CO2. You cite/quote out of context, Kenneth. You apparently didn’t get that this was a sarcastic reply to your claim that CO2 has no effect on water surfaces, i.e. it’s magical in that radiation from it behaves somehow different then in other situations. But then, this is not the first time you intentionally misunderstood something. Please provide the physical measurements from a scientific experiment that shows the heat-changing effects of CO2 variations on water bodies. Your “but a ball behind a wall” analogy will not suffice here. And that is exactly the magic effect I was talking about. Why do you think radiation from CO2 behaves different over a body of water then in the rest of the universe? IR cannot penetrate past the ocean skin layer. Sunlight can. It is you who believe in magic if you believe CO2 IR is the dominant source of net heat changes in the oceans. 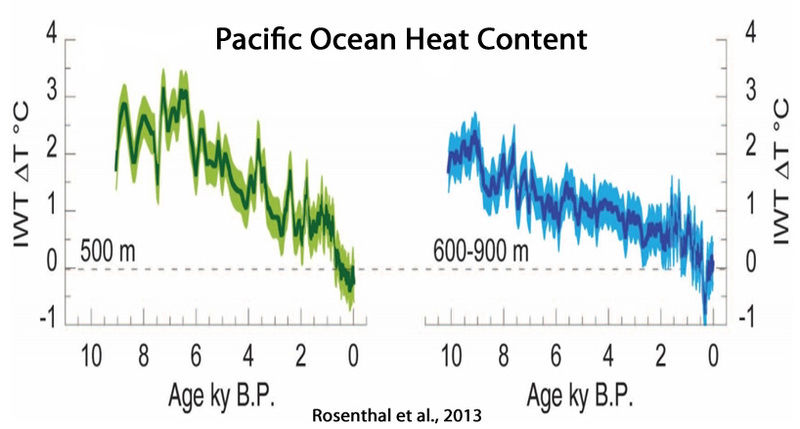 Why do you think it is that the oceans lost heat…. 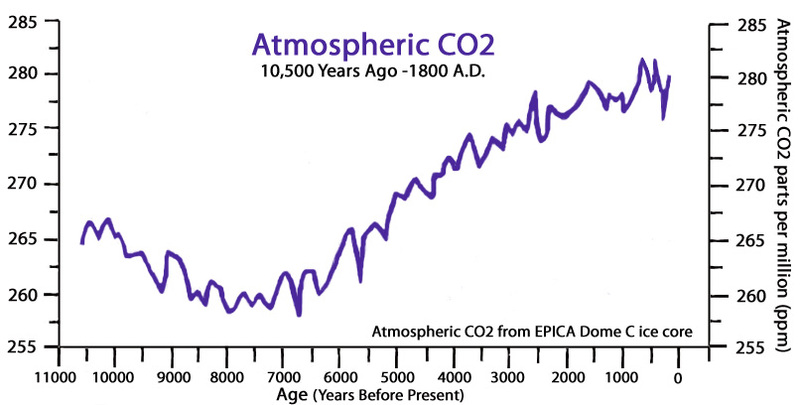 … as CO2 concentrations grew during the Holocene, SebastianH? Why didn’t your version of “simple physics” work for the last 10,000 years? You have yet to show that CO2 causes any warming in a convective atmosphere. All you have is a sort of mindless yapping. Specifically chapter 4 and figure 4. Congratulations, you took a thermal map of the earth and assumed it provided evidence that CO2 was causing the thermal variations. It doesn’t, however. The spectra analyzed was restricted to the 10.88 to 12.03 µm spectral bands because the data set used doesn’t have instrumentation to review the entire CO2 infrared spectra. Also, if this were a study of the actual effects of anthropogenic CO2 and not simply a map of thermal emissions they attribute entirely to CO2, you would have seen effects much, much greater in the northern hemisphere, where the majority of anthropogenic emissions occur. The hottest places on your map correspond directly to the hottest places on earth – places that have been hot for more than the 150 years since the industrial revolution took hold. Seb, did you even read the link? Again, ABSOLUTELY NOTHING showing that CO2 causes warming in a convective atmosphere. There was no warming in 2006. Keep up the MINDLESS yapping, seb. “CO2 is the strongest anthropogenic forcing agent for climate change since pre-industrial times. Indeed . . but what do we expect. Still – with all of the dire projections of what the warmists on the table, it’s wonderful to imagine how all of that will play out if we actually follow the 15 – 20 yrs of ‘pause’ with decades of actual global cooling in the area of 0.5 C.
As you say, Gary, UNPROVEN propaganda non-science from the very first line. @Arsivo: CO2 seems to distribute pretty well globally and why is it a surprise that the hottest regions have the greatest effect? Of course the places with the highest upwelling IR will also receive the highest downwelling IR. @Sunsettommy, garyh845, AndyG55: I know this is against your believes and being able to deny what’s written in certain papers makes it pretty easy to stay in fantasy land where magic rules over physics. Should I continue posting links to papers that were posted on this blog for other reasons and contain measurements of the CO2 GHE effect? You have NOT posted one single paper that shows from measurement that CO2 causes warming ain a convective atmosphere. Excuse me? The Sun is always shining on the planet Earth. It doesn’t just blink out whenever it’s bedtime at your house. WAKE UP! What you (sod, and the other AGW advocates) keep overlooking is that just because there are natural, period fluctuations, those do not cancel out mythical anthropogenic influence. Indeed, natural, period fluctuations, are the ONLY climatic variations and are driven by the lunar/planetary/solar variations. And anthropogenic influence is mythical because there is NO PROOF that it happens on this real world! No modeling of a flat earth with the sun constantly shining at it at 1/4 of the ‘estimated’ level can prove otherwise. You are refering to the way average solar radiation is calculated and the average temperature without the greenhouse effect is derived by using the Stefan-Boltzmann law. You probably think that this is no valid way to calculate such an average. Can you expand on why you think that this is the case? Do you have problem with the math involved? Is it because Earth is rotating and the sun is shining from only one direction? Do you honestly believe that the calculation error from generalizing like that would be high enough to make that 33 degree difference possible? Do you think the error caused by this generalisation would leed to higher or lower calculated average temperatures if the calculations were done with more details? I’d like you to research the Moons average temperature then. From the SB-law, an emissivity of 0.95 and an albedo of 0.1 and the same 1366 W/m² from the sun you can derive that the average surface temperature should be around 275 K, but the real average temperature is 206 K at the equator and ~197 K for the whole Moon. Why do you think those two values differ by so many degrees? Yes I have a method. Stop pretending to know and use all the observational data without having to adjust it to fit the ‘theory’. It is disappointing that people still talk about the 33 Kelvin warming that Earth’s atmosphere (allegedly) brings about. This is based on the idea that Earth’s average temperature is 288 Kelvin compared to 255 Kelvin “Sans Atmosphere”. Consensus scientists can’t explain the 33 Kelvin warming due to the atmosphere in terms of [CO2] so don’t expect them to even try to explain 288 – 197 = 91 Kelvin of warming. Have a read and consider that your pet theory is all wrong! Then WHY are you fighting against atmospheric CO2, seb. Do you really WANT the next ice age. Wouldn’t you do anything to postpone it ??? You should be cheer-leading for the full use of coal in an effort to stay the cooling that is undeniably and inevitably coming. The “increased greenhouse effect” from what source? The 0.007 of a percentage point change in the atmosphere’s CO2 concentration since 1970, or, as the IPCC cites in AR4, the…”overall increase in water vapour of order 5% over the 20th century and about 4% since 1970“? Considering water vapor is easily the most dominant greenhouse gas, and that it is far more abundant in the atmosphere (~40,000 ppm in the tropics), would you agree that the “increased GHE” is predominantly not due to CO2? Kenneth, we know you have problems with magnitudes. How can such a tiny tiny amount of molecules make a difference you ask? Read a book, learn something about concentrations and their effects. The effects of CO2 are measureable and the increase in concentration is measureable too. Regarding your percentages … you might be having a problem with math again. A 70 ppm change from 330 to 400 ppm is an increase by 21.2%. That’s a way bigger increase than 4%. You however are refering to 0.007% which is the absolute amount those 70 ppm represent. The absolute amount of water vapor did not increase by 4% in the same way you describe it for CO2. Why? Because you claim it is 4000 ppm now (in the tropics). Was it 0 ppm (-4%) in the 1970s then? See, I told you that you have serious problems with math and you continue to demonstrate this … stick to your quotes and hope nobody actually reads those papers you link to. No, I didn’t ask that. I was just reporting the actual amount of change in CO2 relative to other changes in other constituents. The key there is the “ppm”, SebastianH. That’s parts per million. So, expressed as a percentage of the atmospheric concentration, CO2 changed from 0.033 to 0.04 between 1970 and now. That’s 0.007. Your value is the change in concentration by itself. CO2 doesn’t function by itself. It functions in its atmospheric context. In 1900, there were 3 parts of the atmosphere that were CO2 out of 10,000 atmospheric parts (0.03). Today, there are 4 parts CO2 out of 10,000 atmospheric parts (0.04). That’s a change of 1/100ths of one percentage point. Water vapor levels reach 40,000 ppm in the tropics, SebastianH. That’s 4% of the atmospheric molecules. This shouldn’t be new information. So if the IPCC claims that water vapor levels increased by 4% since 1970 (that’s not my claim, it’s the IPCC’s), what does that mean to you, SebastianH? Huh? What fabrication are you concocting now? Here’s a paper that compares the relative contribution of water vapor to CO2 within the greenhouse effect. Notice that the authors find that about 1/9th of the increase in temperature could be attributed to CO2, with the rest solar forcing and water vapor changes. Arg … sorry, it’s even more ridiculous. 4000 ppm is only 0.4% not 4% as I wrongly assumed. please Kenneth, stop making these kind of remarks. They make you look much more incompetent than you actually are. In any scientific setting, your position (small numbers can not change anything) would be ripped apart at once. Anyone in a room full of scientists working on the atmosphere would know, that small changes have huge consequences. That’s not my position. I’ve never written that, nor do I agree with it. Even a few percentage points difference in cloud cover, for example, can overwhelm (as express in W m-2) the entire alleged effect of CO2 since 1750. “The observed net cloud forcing is about four times larger than that expected from a doubling of the CO2 content of the atmosphere (Ramanathan et al., 1989, pg. 57). The SW and LW components individually [of cloud cover changes] are approximately 10 times as large as the effect of doubling CO2 in the atmosphere. … A variation in cloud cover of 3% during an average 11-year solar cycle produces an effect of approximately 0.8 to 1.7 W/m-2. Significantly, this amount is similar to the total radiative forcing of 1.56 W/m-2 estimated for the increase in atmospheric CO2 since 1750″. A 0.1% change in the Sun’s radiance (from solar min to solar max in the 11-year cycle) is even detectable in temperature changes at a 95% confidence interval. Do you agree that this is true for water vapor changes, cloud cover changes, and solar irradiance changes? Or do you only believe this is true for CO2? I’m guessing the latter. That’s not very consistent, sod. Kenneth, you amazingly did it again. This time you changed the water vapor concentration from 4000 ppm to 40000 ppm … doesn’t matter. If you say the CO2 increase was 0.007% and the 4% increase in water vapor is calculated the same way than it was 0 ppm in 1970? Doesn’t make sense, does it? The 4% are of cource relative and the corresponding relative change in CO2 is 21% in same period. I say it again: stick to quotes and keep ignoring math and numbers. Again you’re having some trouble with magnitudes, SebastianH. Water vapor concentrations range between about 10,000 ppm and 40,000 ppm globally. CO2 concentrations reach 400 ppm globally. (I could have sworn that I wrote 40,000 originally, but apparently I missed a zero in my haste). If the water vapor concentration changed by 4% since 1970 (according to the IPCC, not me), and if the CO2 concentration changed by 21% since 1970 (by itself), which change comparitively affected the atmospheric “greenhouse gas” concentration more considering their relative atmospheric concentration volume differences? I never wrote that water vapor concentrations were “0 ppm” in 1970. I just reported the IPCC’s claim that the atmosphere’s water vapor concentrations increased by 4% since 1970. But you knew that. You’re just fabricating (again). The atmospheric CO2 concentration was 0.033% in 1970. Today, it’s 0.04%. So during those years, the proportion of the atmosphere‘s gases that are CO2 has changed by 0.007. Do you disagree? Poor sob.. NOTHING could make you look more incompetent that you actually are. GROSS incompetence is your ONLY redeeming characteristic. I would like you all to think carefully about one of the REAL problems facing the future of the planet. Over the next 50 years or so, it is estimated that the Earth’s population could grow by some 5 billion. I assume that these extra people will require to be fed. Now, all food on this planet, be it meat, vegetables, grains, fruit etc is ultimately dependant on one single chemical reaction. That chemical reaction is photosynthesis. Photosynthesis requires 3 basic ingredients. Sunlight, H2O and CO2. HOW are we going to raise the atmospheric CO2 concentration far enough to feed these extra 5 billion or so people ? Thankfully, China and India are doing their bit, but other countries need to wake up to the reality of the situation. THE ATMOSPHERE NEEDS MORE CO2, NOT LESS. The one with the magnitude problem is you Kenneth! And a math problem on top of that. I do not disagree, but you seem to think a 4% change in water vapor concentration means the same thing. 4% in that context would equal a 40000 ppm change, so did it change by that amount or not? If it has than your tropical max of now 40000 ppm would have been 0 ppm in 1970, wouldn’t it? The IPCC’s claim is that is increased by 4% and that means the value changed by that fraction. No back to magnitudes. It’s often written – and I think you even quoted it once – that CO2’s part in the greenhouse effect is around 25% and water vapor dominates the effect with 75%. A 21% increase in CO2 would then be the same as a 7% increase in water vapor in terms of magnitudes of the resulting change in the greenhouse effect. Even if water vapor increases were totally independent of CO2 increases (no feedbacks), I really don’t know why you try to argue that it’s magnitudes greater … it’s not and – surprise – both increases happened … and yet you keep posting that greenhouse effect hiatus paper that clearly notes that the effect continued, the temperature increase in the atmosphere/surface just slowed down. And the explanation they give is pretty straight forward too … yet you ignore it and claim there has been no greenhouse effect for the past two decades. Keep to your quotes and try to get a better understanding of math. Specifically absolute and relative percentages/forcings … you’ve had problem with that before and in this thread you display that you really don’t get the difference. A 4% change in a gaseous volume of 40,000 ppm would be 1,600 ppm, and a 4% change in a gaseous volume of 10,000 ppm (high latitudes) would be 400 ppm. So apparently the IPCC has claimed that the water vapor volume has changed by approximately 400 ppm to 1,600 ppm since 1970. Your “4% in that context would equal a 40000 ppm change” illogic is another ridiculous conconction. If comparing the water vapor change of 400 ppm – 1,600 ppm (~1,000 ppm) alleged by the IPCC to its atmospheric context, the net percentage change would be ~0.1. Which, again, is substantially more than the 0.007 for CO2 since 1970. Um, no. A 4% increase in an existing water vapor content of 10,000 to 40,000 ppm does not mean that the IPCC is saying that the water vapor content of the atmosphere was 0 ppm in 1970. Do you ever stop just making stuff up, SebastianH? Um, yes, it continued with a radiative forcing of 0 W m-2 during 1992-2014 according to that paper. So what caused the temperature increase during those years since the radiative forcing from the greenhouse effect went on hiatus? Will you continue to avoid this question? The paper says that the greenhouse effect went on hiatus during 1992-2014. Considering human emissions rates increased by 65% during those years, what does that say about the radiative forcing capabilities of anthropogenic CO2? Kenneth, if a 4% change in water vapor equals either 400 ppm (coming from 10000 ppm) or 1600 ppm (coming from 40000 ppm), then what represents a 4% change coming from a 330 ppm value? Also I gave you a way to calculate the impact of changes in water vapor concentration and CO2 concentration. CO2 concentration would have to increase by just 12% to have the same effect as a 4% water vapor increase, but it did increase by 21%. Do you now understand your error and can stop making yourself look like a math illiterate? Or do you want further explanations? Which part is unclear to you? Do you ever stop just making stuff up, SebastianH? You are the one who – intentionally or not – missunderstands written words and apparently only reads what he wants to read into something. When you finally find out why your percentage calculation is incorrect, maybe you’ll understand what i was writing. Note that both aforementioned hypotheses indeed include an enhancing greenhouse effect in which more heat is captured by the Earth–atmosphere system. The main difference between them is how this additional energy is prevented from warming the Earth’s surface. There was no pause in the effect, it just didn’t warm the surface/atmosphere as much as was expected. So the energy got trapped elsewhere … like in the oceans (as explained in that paper). I’m reminded of the time that it was pointed out to that scientists (Stephens et al., 2012) had claimed that the radiation imbalance was 0.6 W m-2 (+/- 17 W m-2) for 2000-2010, and other scientists had claimed that the forcing from CO2 was 0.2 W m-2 (Feldman et al., 2015) for 2000-2010, and I asked you what non-CO2 mechanism caused the 0.4 W m-2 forcing (the difference between 0.6 and 0.2) and you denied that there was a discrepancy between the imbalance estimate and the CO2 forcing estimate, instead claiming that CO2 was responsible for the imbalance anyway. When you’re presented with numbers and magnitudes that don’t conform to your beliefs, you pivot to making up illogical comparisons and analogies that have next to nothing to do with the original assertion. And then you try to use creative condescension to imply that I am the one who has the “math” problem or magnitude problem. Once again, SebastianH, you are digging yourself into an even deeper hole of illogical thought. The “what represents a 4% change coming from a 330 ppm value” [for CO2?] is a made-up comparison. There is no 4% change in CO2. There’s a change of 0.007 of a percentage point for CO2 since 1970 when expressed in its atmospheric context (0.033% of the atmospheric gases vs. 0.04% today). The IPCC has claimed that water vapor concentrations increased by 4% since 1970. Considering water vapor volumes generally range between 10,000 ppm and 40,000 ppm in the atmosphere, a 4% alleged change in those values is about 1,000 ppm on average (400 to 1,600 ppm). So we’re comparing a 70 ppm change in atmospheric CO2 concentration (330 ppm to 400 ppm) to a 1,000 ppm change in atmospheric water vapor concentration. And yet because you obviously don’t like that 1,000 ppm is about 15 times greater than 70 ppm, you have decided to claim that the CO2 change is nonetheless greater than the water vapor change via an illogical leap of faith anyway. CO2 always wins…because…it does. So a 0 W m-2 forcing for the CO2 GHE between 1992-2014 is not a pause in the forcing. 0 W m-2 is a positive forcing effect for the CO2 GHE because 0 is…positive. Whatever, SebastianH. It’s hopeless. Like that paper that proves CO2 causes any warming in a convective atmosphere, or the paper that shows CO2 causes warming of the ocean surface. Batting ZERO still, seb. You sound like Trenberth.. what a travesty !! Kenneth, a change from 330 ppm to 400 ppm is a change by 70 ppm which is a change by 21.2% from the original 330 ppm value. Or in other words: 400 ppm is 121.2% of 330 ppm. If the water vapor concentration increased from 25000 ppm to 26000 ppm than this is a change by 1000 ppm or by 4%. Or in other words: 26000 ppm is 104% of 25000 ppm. That’s the math. If you say those 70 ppm above are a change by 0.007% (another way to write 70 ppm), then the 1000 ppm in the second calculation is a 0.1% (another way to write 1000 ppm). It is beyond me why you would think that I am making anything up here. Regarding the GHE effect … analogy time? Imagine I give you a dollar each day and you put it in your savings account. You get wealthier every day for the rest of your life. Now imaging you start spending the dollar instead of saving it. Your balance does not increase, but did I stop to give you a dollar each day? No. That’s what this note says. I don’t care if you understand this or not. Over and out. What you are continuing to not understand, intentionally or unintentionally, is that water vapor and CO2 do not start from the same baseline in terms of the volume of molecules in the atmosphere. Water vapor as an atmospheric gas is up to 100 times greater than CO2 in volume. Therefore, directly comparing the percentage of change in CO2 or water vapor themselves is comparing apples to watermelons. Correct. That’s exactly what I wrote yesterday. Now you’re comparing apples to apples. And a 0.1% change in water vapor volume is ~15 times greater than the 0.007% change in CO2 volume. But yet you insist on glossing over the change in the atmospheric context for CO2 (0.007%) because you realize it is so tiny. This way, you can use the larger number (21%) and claim that the CO2 forcing is greater because 21% is greater than 4%. Ridiculous. Your claims of “maths” superiority is quite amusing given yet another embarrassing display of illogical numbers-crunching. Yes, I know it is beyond you why claiming the CO2 change was greater than the alleged water vapor change (despite 1,000 ppm being 15 times greater than 70 ppm) was yet another example of you making things up to fit your agenda. Just like when you claim that the 0 W m-2 CO2 greenhouse forcing for 1992-2014 (Song et al., 2016) was still a positive forcing. Because 0 is positive. And your claim that 0.2 is greater than 0.4 for the forcing discrepancy between Feldman et al. (2015) and Stephens et al. (2012) for 2000-2010. Wow, you’re really good with numbers, SebastianH. And just so you know, I have stopped reading your intolerable analogies. So as soon as I read “if I give you a dollar…”, I’m done. Therefore, directly comparing the percentage of change in CO2 or water vapor themselves is comparing apples to watermelons. No it isn’t. If you want to compare growth then you can compare the percentages sales or profit increased or the percentage the employee count increased, etc. You compare those percentages and not the absolut changes, since those are not directly comparable. You tried to fool yourself by comparing directly with water vapor vs. CO2. And I already showed you (in this thread) how you can compare those percentages (21% vs. 4%) in terms of impact to the climate system. Because we know more or less how much of the GHE can be attributed to water vapor and how much to CO2. If it’s a 75/25% split then we have to devide the CO2 increase (21%) by 3 in order to get a figure that can be compared in terms of impact. Or because math we can calculate that a 84/16% split would mean both increases have the same impact. So what is the split for water vapor impact vs. CO2 impact today? I am sure you have a paper about that in your lists. To clearify: I mean the forcings, not the percentages/mass distribution in the atmosphere. P.S. : This impact calculation does obviously not include possible feedback mechanisms. And just like that you agree that your comparison of 4% and 0.007% was not apples vs. apples? Of course 4% vs. 0.007% isn’t apples to apples. This was all just another concoction of yours so that you could attempt to play “gotcha”. Once again, all I was doing was pointing out that the IPCC has alleged that water vapor increased by 4% since 1970. I thought it would be obvious that a 4% change in a gaseous concentration that is already two orders of magnitude more abundant in the atmosphere than CO2 would mean that the net gaseous concentration difference would be substantially larger for water vapor than for CO2 with a 4% change. But no, apparently this is not obvious to you. So you made up the dishonest claim that I was saying water vapor was 0 ppm in 1970. Or you tried to claim that a 21% increase in CO2 still yields a greater forcing than a 4% change in water vapor because you, for reasons that I suspect are disingenuous, decided that starting from a baseline of 0.033% is the same as starting from a baseline of up to 4%. If the Sun’s irradiance decreased by 4%, and the CO2 concentration decreased by 21% (back to 330 ppm), which forcing would have a greater impact on the climate — the change in the Sun’s radiance or the change in the CO2 concentration? Why? This is interesting. So now you’re claiming that all along it is I who was attempting to fool myself. How does one go about doing that, SebastianH? Do you have experience with fooling yourself? The 0.007 of a percentage point change in the atmosphere’s CO2 concentration since 1970, or, as the IPCC cites in AR4, the…”overall increase in water vapour of order 5% over the 20th century and about 4% since 1970“? And you never repeatedly compared that 0.007% value to the 4% value for water vapor? And again you ignore that CO2 has a greater impact per ppm than water vapor. What is the current split of both influences? I can see where you may have gotten confused. I was assuming it was obvious that comparing the “change in the atmosphere’s CO2 concentration” to what the quoted IPCC terms the “overall increase in water vapour” would be descriptive enough for you to understand the difference between those percentage values. I knew the difference between the two, but I didn’t spell it out clearly enough for you to understand, apparently. Um, no, I didn’t. In fact, I just looked, and found this quote above was the only time that I used 0.007% and 4% in the same sentence — and even then it was clear (to me) that I was comparing the change in the atmospheric gas concentration that is CO2 when I wrote 0.007%, not the change in the CO2 concentration itself. I even clarified this distinction later. But far be it from you to make up stuff and claim I “repeatedly” wrote something I didn’t (that you apparently misunderstood anyway). And far be it from you to dishonestly claim that I was saying that water vapor levels were 0 ppm in 1970 just so you could play your juvenile “gotcha” games. The spectral analysis show that in the prevailing atmospheric conditions the warming potency of methane is about 14% from the potency of CO2, and the same of N2O is about 17%. The effect of water in the same conditions is 15.2 times greater than that of CO2. The Beer-Lambert law does not apply strictly to the relationship between radiative forcing (RF) of CO2 and concentration in the atmosphere, i.e., ΔRF = 5.35ln(C/Co). It is an approximation because water vapour competes unevenly with CO2 over the IR absorption wavelength range. We propose a quadratic model as an improved approximation. It links concentration to RF thereby allowing RF calculation at any concentration, not just ΔRF. For example, at 378 ppmv of CO2, the level in 2005, it calculates RF = 8.67 W m−2, or approximately 2.7% of the total RF of all the greenhouse gases. A second and independent method based on worldwide hourly measurements of atmospheric temperature and relative humidity confirms this percentage. Each method shows that, on average, water vapour contributes approximately 96% of current greenhouse gas warming. Thus, the factors controlling the amount of water vapour in the air also control the earth’s temperature. If AGW were true, it may happen by natural fluctuations that a time series of global mean temperatures remains flat for twenty years. Deciding that AGW is false, would mean a Type II error with associated probability beta. If AGW were false, it may happen by natural fluctuations that the time series goes up with a certain slope. Deciding that AGW is true, would be a Type I error with probability alpha. Frame the question this way (power-analysis): for alpha and beta five percent and a theoretical slope of so and so much, how many years of data do we need for making a decision? That number depends on the slope. If AGW would mean two extra degrees Celsius per century, the period may be rather short. With one hundredth of a degree per century, it may take a few thousand years to reach a conclusion. This may show that if you do not want a conclusion (with fixed error rates), you should not talk about effect size. This creates a simple world with warmists saying there is an effect and deniers who say there is no effect. May I invite Sebastian to come out of his closet and tell us what his effect size is? If AGW were true, it may happen by natural fluctuations that a time series of global mean temperatures remains flat for twenty years. It hasn’t been flat and will most likely never be flat. It may very well be that this change is not all “Made by humans” or caused by feedbacks to human actions. But that influence is going to be there wether or not the planet continues to warm or it begins to cool. So lets say the effect is 2 degrees Celsius per century. How short is the period? SebastianH, did you notice that Mindert Eiting wrote 20 years? 1979-present is not 20 years. Everyone agrees there was a statistically significant warming from 1979-1998. In the 18 years between 1998 and 2016, however, temperatures were flat. Within about a year, the flat trend will likely return…and make 20 years of no temperature increase. 1980-1997 was basically zero trend and 2001 to 2015 was also zero trend. Kenneth, ok I’ll bite … 20 years. You can not just exclude those extreme El Nino temperature changes. So if the greenhouse effect for CO2 was flat, and temperature only changed by 0.1 C during that period, what was the cause of that whopping 0.1 C change in temperature, SebastianH? If you are looking for anthropogenic warming, you have to exclude the El Ninos. Otherwise YOU are just fooling yourself, and showing natural solar based warming instead. We all know that CO2 DOES NOT cause warming of the oceans, any more than it causes warming of a convective atmosphere. When you do that, you find the FACT that there is…..
No warming before the 1998 El Nino.. There is NO WARMING in either RSS or UAH apart for that 1998 El Nino step. There is still 3 or 4 years left of the current solar cycle. Cooling is imminent.. how much and how quickly, only time will tell. Let’s have a look at some REAL Land data. Not junk, 50% fabricated from rubbish surface stations. And NO WARMING in UAH land between El Ninos. 3. No warming in the southern polar region for the whole 39 years of the satellite record. There IS NO CO2 WARMING effect evident in real temperature records. The ONLY warming has come from regional El Nino effects, and ocean circulation effects such as the PDO and AMO. Sebastian, try to follow an argument, being an important chapter of statistics. In your first sentence you already shoot in your own feet but finally you say two degrees Celsius (or Kelvin) per century. Thank you very much. The power-analysis is complicated here because weather events are not truly random. Nevertheless, there must be an one-to-one relationship between effect size and sample size (number of observation years) with alpha and beta fixed. With two degrees you will get one number like 21.7 observation years (my guess). The observational result may be that the warming effect during 22 years is not significant at alpha level. Rejecting the AGW claim in that case implies that beta is five percent as we had decided in a game, being as fair as chess. The point is that warmists after it was found that 97 percent of their models did not agree with the data, began to talk about beta. Five percent is quite a lot. For a question about the fate of our planet we may require one millionth. This produces a new graph, by which we may find that a two-degrees-effect corresponds with ten million observation years. If you want absolute certainty you will never make a decision and the discussion may go one from here to eternity. In your first sentence you already shoot in your own feet but finally you say two degrees Celsius (or Kelvin) per century. You suggested the number and please tell me you don’t think that the temperature curves were flat at any time in recent history. Some here argue that temperature rises in steps and is flat between … the deniers way to look at curves apparently. If you want absolute certainty you will never make a decision and the discussion may go one from here to eternity. That would be the case if this were a random system inside a blackbox to us. It’s not. We do understand how lots of processes work and we do know about the effects greenhouse gases have, despite some people here claiming that this is untrue and some magic effects make the surface of this planet warm. Your argument seems to be that we don’t really need to do anything about it, because we could only tell if we made a difference in a few “million years”? But we already know that we have some influence on the climate. Yeah, I know … the skeptic will deny that position, but that doesn’t make it less true. Sorry. So then why do equilibrium climate sensitivity estimates range from 0.7 C to 5 C in the last IPCC report? Why did the IPCC admit that 111 of 114 climate models (predicated on CO2 changes) fail to simulate that global warming hiatus? Again that quote you didn’t understand and cite out of context. Magic effects that make the surface warm than it would be without the greenhouse effect include: the “gravito thermal effect” or “misscalculation of the SB-law” and many more strange explanations with magical physics effects. The REAL fairy-tale is that CO2 has any warming effect in a convective atmosphere. That atmosphere being PROVABLY controlled by the gravity/thermal effect. You have never produced one bit of proof that CO2 “magically” overcomes that gravity base thermal control of the atmosphere. Its all is you stupefied imagination. You are STILL batting ZERO on your CO2 warming farce, seb. Rather pathetic that you dismiss PROVEN effects, yet still just “believe” in the FAKE UNPROVEN basis of your religion. Not one paper.. we are still waiting. !!! Do your REALLY want everybody to see just how NIL-educated you are ? That stronger sun just might have given us that extra 0.5 C . . which it is now set to take back. Yin-yang. Trump is trying to entrench “sceptic” positions by cutting science down. Great plan! Why are you complaining, Sod? You warmists for years and years say, “the science is settled” or, that there is an “overwhelming consensus for climate change” or, that we have reached a “tipping point” to run away warming. Since warmists have long claimed the science is settled, why continue the pork barrel funding for climate science research, you say is already settled,backed by overwhelming consensus,that has long ago reached a tipping point? Better to put the funds to better use in other places, such as psychiatry hospitals for those poor warmists, who are increasingly found on the floor in fetal positions, at the sight of verifiable science research being spotted. Don’t worry skeptics will carry on running the world of science research undisturbed. The Alarmists models don’t work going back, at all!